Send A Little Love With Homemade Gifts For The Holidays! Want to make an impression this holiday season with homemade gifts? This year, try your hand at crafting a homemade gift. Even if you don't feel especially artistic, or don't know your knitting needle from a crochet hook, there are ideas here for homemade gifts that anyone can put to good use. This is a great gift for those who have "everything" already. And better yet, there are several ways you can customize it for each recipient - with nuts, candy, coconut, peanut butter, different flavors, etc. 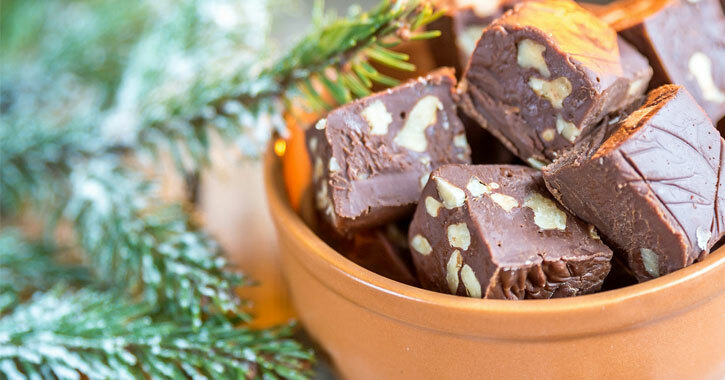 Chop the fudge into cubes and arrange with some holiday themed tissue paper inside a tin. A simple google search or phone call to Grandma, and you're well on your way to a great fudge recipe. Some are amazingly simple, taking just a few minutes, a few ingredients, and a microwave to create. For those who love to cook, share the passion! Whether it's a killer apple pie, savory cheese dip, or amazing chocolate chip cookies, many of us know how to please the palate with our secret recipes. Why keep this to yourself or limit it to your family this season? Whip up a batch of your secret recipe, whatever that may be, and package it up for your neighbor, coworker, or other friends to enjoy this holiday season. If you're up for giving away your secrets, include the recipe with the dish so they can make it for themselves. It's the gift that keeps on giving! If you are handy at the sewing machine and have some time to dedicate to a special homemade gift, a quilt is an excellent way to go. Pull together fabrics that speak to the personality of the person on your list, and if you're unsure, just choose colors that will coordinate with their decor or that you know they like. Once complete, you will have a thoughtful gift that will be cherished for years to come. Whether it's a new Christmas stocking for your brother, a cozy pair of mittens for your niece, or a pair of knit booties for the new baby in the family, those with needle skills can put them to good use this Christmas. Whether you're an old pro or new at this, knitted and crocheted creations are a great homemade gift from the heart that show you put time, effort, and consideration into it. Beginners can tackle easy, but perrenial favorites, such as scarves. Not so handy with a sewing machine or knitting needles? No worries! For a close friend or relative, you can pull together a fantastic scrapbook filled with your favorite memories together. You may want to pick up a scrapbook album and kit from the local craft store, but that doesn't take away from the fact that you are the one customizing and creating it from scratch. Select favorite photos, include any ticket stubs or receipts and other mementos you've been holding onto, and get started on a scrapbook that will be bursting with memories. The days and weeks prior to the holidays can be very stressful for many people. You can help alleviate the stress by offering your time and assistance before the holidays as your gift. Volunteer to watch the kids so mom or dad can get a night of shopping (or relaxing) in. Offer to wrap gifts for those that dread this task. Give someone a couple hours of light housekeeping or deep cleaning. Offer your help as your friends or family finish their last-minute projects before the holidays. Your time and help in advance just may be the greatest gift they will receive this year! Homemade coupons are a favorite among many families and friends! You can give a coupon for a free night of babysitting. If you are handy with car maintenance, you could offer a free oil change. Depending on what you're good at, you could offer a free photo session, guitar lessons, home-cooked meal, haircut, painting, financial advising, etc. Everyone has their own skills and trades, and it's nice to swap services. You could also use a coupon in place of gift cards as a way to put off the expense for a few months (so your wallet doesn't take a big hit all at once). For example, give a coupon for free dinner and a movie, which they can redeem at some point in the future. Let the ideas flow! Ready to try one of these homemade gifts for the holidays? Just remember, it's the thought that counts, and with the amount of thought and consideration that goes into a homemade gift, your friends and family are sure to be pleased. Good luck and happy holidays!